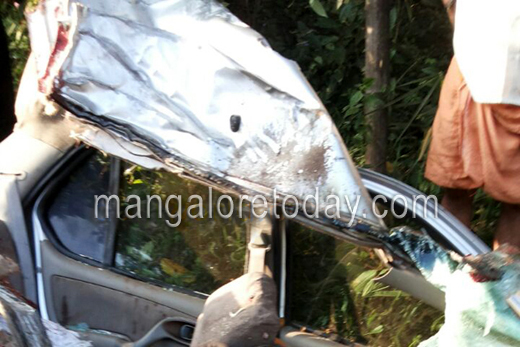 Belthangady, Dec 25, 2014 : An accident involving an Indigo car and a KSRTC bus at Puduvettu Cross near Dharmasthala on December 25, Thursday morning, has claimed the life of two persons. Two others sustained injuries in the mishap. If the car was heading towards Dhramasthala from Bengaluru, the bus was proceeding towards Mysuru from Dharmasthala. The two persons whose identities are not known, died on the spot. One of them is a woman. In all five people were travelling in the car. Some people around blamed the reckless driving of the KSRTC bus driver for the accident. The impact of the collision was such that the car was badly mangled. The local police have registered a case.